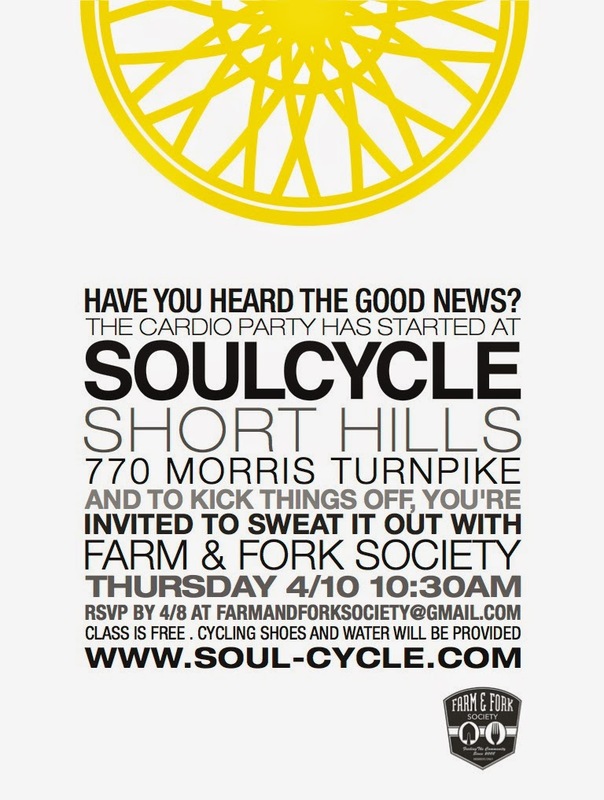 Farm & Fork Society: Come Ride with Us at SOULCYCLE Thursday, April 10, 10:30 AM -- FREE! Come Ride with Us at SOULCYCLE Thursday, April 10, 10:30 AM -- FREE! The Farm & Fork Society is committed to helping you live and eat better. With that goal in mind, we are pleased to announce that we have teamed up with SOULCYCLE Short Hills to give you the opportunity to meet us and ride for free! On Thursday, April 10th at 10:30 AM you are invited to sweat it out with us at SOULCYCLE Short Hills located at 770 Morris Turnpike, Short Hills. You will also be able to quench your thirst after your ride with nourishing juices from Millburns own Green Nectar Juicery. Class is free. Water and cycling shoes will be provided. To join us, please RSVP by Tuesday, April 8th to farmandforksociety at gmail.com.